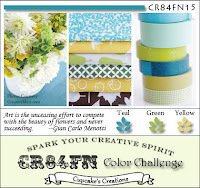 It's time for another wonderful color challenge from the CR84FN Blog! Can you believe we are already on color challenge #15, we'd love having you play along. 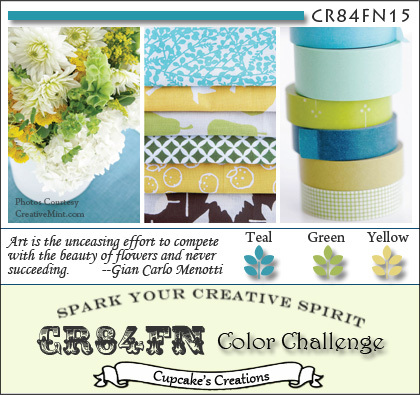 This weeks fab colors are Teal, Green, and Yellow , such a beautiful color combination! I don't normally make a habit of purchasing new product for challenges, as I try to use stuff I already have on hand, but on a recent trip to Michaels last week, I found these wonderful butterflies by Recollections. They were on sale for 40% off and fit the colors perfectly this week, so I couldn't pass them up! My sketch inspiration came from Get Sketchy #74, I did change my card size to 5-1/4" x 5-1/4". My three panels are all scraps of Core'dinations papers, embossed with the Texture Fades Damask Folder, then sanded. I added this sentiment from Stampotique. Here's this weeks color inspiration, we'd love for you to play along with us at CR84FN, you can find all the details here on how to enter. If you upload to any online gallery please use keyword CR84FN15 so we can find your creations! Finished Size 5-1/4" x 5-1/4"
Beautiful card, Lisa! I really love that sentiment & the great butterflies. Gorgeous! Beautiful cards Lisa! The butterflies are breathtaking! Wonderful layout and detail too. Beautifully vibrant, love the colouring on the butterflies, and the embossed panels are fab. Lisa, I can see why you had to have the butterflies - they're magnificent!! I really like the embossed background, and the sentiment is lovely! What a beautiful card! Love those butterflies! I can see why you bought the butterflies...they are perfect. I love going and finding new things. It is always so hard to pass up. WOW! So pretty!!! Those butterflies are PERFECT and absolutely gorgeous!!! LOVE the GORGEOUS colored, embossed panels! Gorgeous card, Lisa! Love the color blocked, embossed panels and the butterflies are stunning! Your card is beautiful Lisa! Those butterflies are so pretty! Thanks so much for playing at Wee Memories this week. Wow pretty pretty pretty, luv the b'flies, and the 3 colored panels behind. Lisa, LOVE those butterflies! What a FIND! They look so pretty against the three colored panels! And who could resist the bling??!!! FAB card! OMG, Lisa, your card is amazing! I adore the creative embossing and sanding here! And those butterflies are ever so pretty! Great job! This is positively gorgeous! I love the colors and the textures. It is just divine! Your background made of scraps? Let me tell you; I love your scraps :). These butterflies are gorgeous. I've been looking around at your blog and I can see that you love to work with black. Also on this card and it's beautiful! Those butterflies are stunning,definitely a purchase well worth it! Wow, Lisa this is a jaw dropper! Love, love, love it! And thank you for joining the Simon Says Stamp and Show Challenge! Beautiful card Lisa. The three color panels embossed and covered with white really stand out. LOve...he color inspiration...what vibrancy...especiall that one shade of green...love the flow of your card. I am the opposite - I love an upcoming challenge as an excuse to buy new things :) These butterflies are gorgeous, how could you resist at 40% off?? WOW!! the butterflies are so beautiful!!! Wow so gorgeous love the butterflies!! !Thanks for playing along with us at Wee Memories!!!! The butterflies are awesome and so colorful. I really like your sanded background. Beautiful creation! Love those beautiful butterflies and how they pop out!! What a gorgeous card! 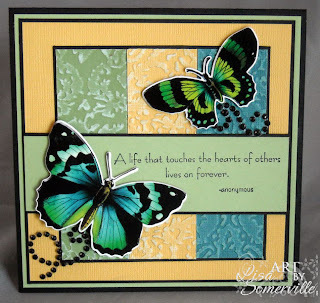 LOVE those embossed panels and beautiful, gradient butterflies! Thanks so much for playing along with us at Wee Memories Scrappy Saturday Challenge!